We love to roll up our sleeves to build amazing environments from the ground up. Last month, we had the opportunity to conceptualize and produce a space for First Hawaiian Bank during the 2015 Hawaii Food and Wine Festival (HFWF) at the Modern Honolulu's Chopstix and Cocktails event. 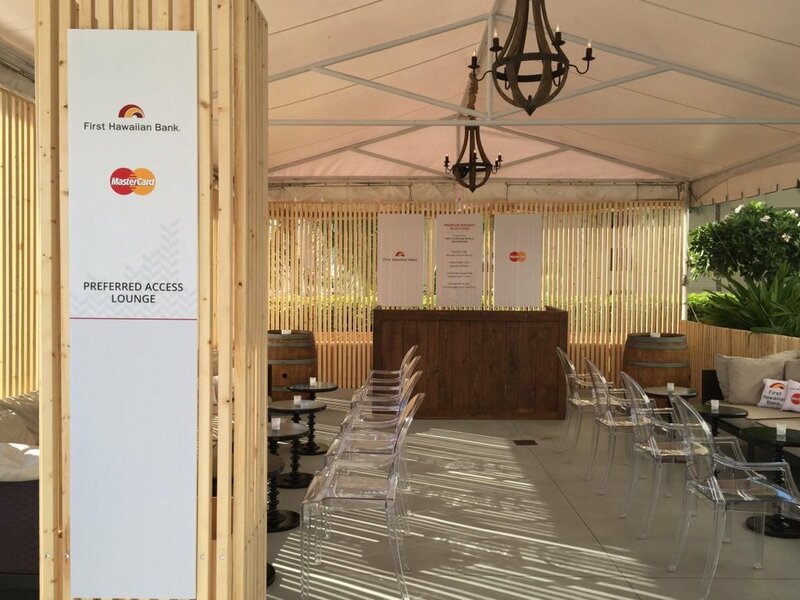 As a preferred access lounge space for MasterCard holders to sample exclusive whiskeys from around the globe, we wanted to create a space that felt intimate and celebrated the sponsors and their curated selection of spirits. Given the evening's Chopstix and Cocktails theme, we were inspired by chopsticks, and custom fabricated walls to mimic bamboo chopsticks. Construction spanned several days and consisted of natural pine positioned in a slat wall formation. The slat walls allowed a sense of intimacy while still letting the ocean vistas and environment shine through. Check out a quick clip of the install below. Anchoring the space was a 6' wooden bar comprised of rustic planks. We also brought in wooden barrels as high-boys and hung wooden chandeliers that echoed the silhouette and soft curves of whiskey barrels. We then positioned long banquette-style seating adorned with custom throw pillows, low cocktail tables, and our Louis Ghost Chairs to create a comfortable yet social atmosphere. Mahalo to the FHB team for having us design your pop-up, and cheers to the perfect paring of design and drink!